Create your own work area with this very strong, lightweight, 1-3/16″ extruded aluminum frame made to stand up to the toughest shop environments. Goff’s Screens provide protection & privacy for a variety of applications by creating a barrier between machinery and work areas and other personnel. Constructed with a very sturdy, lightweight extruded aluminum frame, Goff’s Screens are made to withstand harsh shop environments. Available in custom sizes, screens are easy to set up and arrange in different shapes to meet work demands. 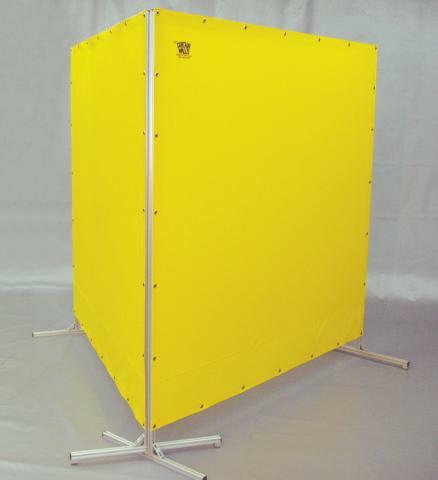 Goff’s Privacy Screens are available in sizes between 3’x4′ up to 8’x8′. Blue, white, forest green, yellow, red, gray, purple, maroon, beige, black, orange, & field green.